When our granite counters were installed in our kitchen, I was shocked to find out that I couldn’t use vinegar to clean them (the acid can etch away at the finish). 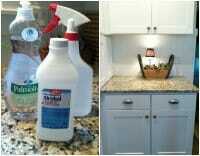 I searched for a DIY granite cleaner I could make at home. It didn’t take me long to find several different recipes — and today, I’m sharing my simplified DIY granite cleaner that takes all of 10 seconds to mix up and costs pennies! 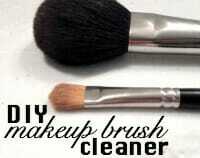 When was the last time you cleaned your makeup brushes? If you can’t remember — it’s probably about time! Today, I’m sharing my favorite DIY makeup brush cleaner I’ve been using for years. There are only 2-ingredients and it takes less than 5-minutes! 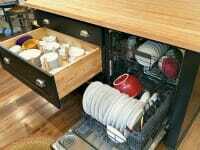 If it’s been awhile since you cleaned your dishwasher (or if you didn’t even know you could clean your dishwasher), I’d suggest giving this SIMPLE 3-step process a try… you might be surprised how much better your dishwasher runs as a result! 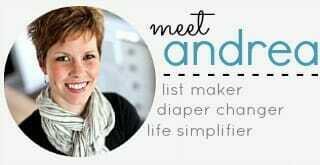 Last week I shared 8 tips to simplify my weekly cleaning routine — and as a follow-up, I thought it might be fitting to share several of MY favorite homemade DIY cleaners. They are all super easy to make using simple ingredients you most likely have in your cabinets right now! Earlier this month, I shared that one of my favorite things is foaming hand soap — since it makes it so much easier for kids to wash their hands. 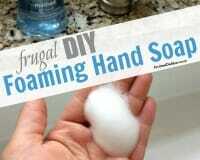 Well today, I’m sharing how I make super frugal DIY foaming hand soap for pennies a bottle! Although I absolutely adore Nora’s curls, her hair is snarly, hard to comb, and a pain to control. Add in the fact that she doesn’t love any amount of water on her face or head, and you can imagine how difficult it is to wash her hair — let alone use conditioner to control the frizz and snarls! 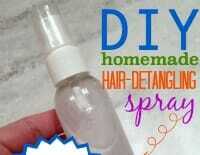 Enter my free, 20-second, DIY Hair Detangling Spray (a.k.a. “magic spray”) and we’ve almost eliminated the hair brushing battles at our house! This time of year, I always rekindle my friendship with my box of baking soda. Not for baking, or cleaning, or freshening — although those are all excellent uses for baking soda. 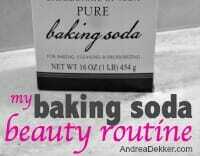 I use baking soda to soften my skin, to soothe my hands, to scrub my face, and, in general, to simplify my beauty routine! Over the past 3+ years, I’ve shared a number of DIY cleaning products here on the blog; however, I’ve never shared a recipe for DIY laundry detergent because I couldn’t find a recipe I actually liked. 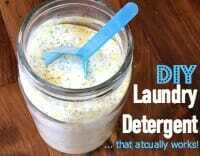 That all changed a couple months ago — so today, I’m sharing my new favorite DIY laundry detergent. It works fabulously, it’s really easy to make, it’s quite frugal, and it makes a huge batch! Have you ever noticed a gross smell coming from your sink — or, more likely, from your garbage disposal? 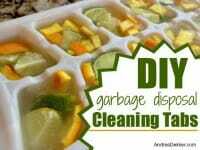 Today, I’m sharing a SUPER simple recipe for garbage disposal cleaning tabs that’s basically free and uses ingredients you most likely have in your pantry! 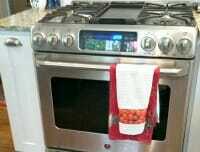 Before I had stainless steel appliances, I was ALWAYS told how difficult they were to keep clean — and how expensive the cleaning products were. 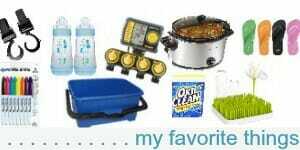 I was unsure if I’d be able to find a more frugal cleaning alternative… but I had to at least try. 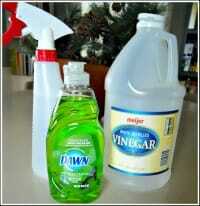 After a little research, I found 4 different DIY stainless steel cleaners you most likely already have in your home! I Cleaned My Shower Fixtures… with Lemons! As I searched the internet for ideas to quickly and easily clean the hard water spots on our chrome shower fixtures, I stumbled upon a genius idea that will save me hours and hours of cleaning in the future — LEMONS! Lemons are a frugal way to naturally clean and disinfect so many areas of your home — and today, I’m sharing how I clean my shower fixtures (and a few other things) with lemons. I’ve been going crazy with vinegar lately… so I’ve been buying 2 or 3 of the huge 128 oz. containers at a time! I’ve saved SO much money by using vinegar instead of more expensive store-bought items… and I feel like I’m also improving our home environment by not “polluting” it with so many harsh chemicals! 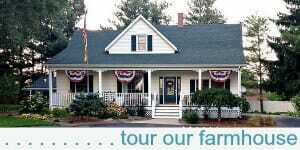 It took me awhile to put this list together… but here it is: 101 more uses for vinegar! A few weeks ago, I shared how I keep our showers clean in about 10 minutes a month. 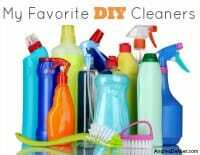 I mentioned that although I try to use mostly homemade cleaners in and around our house, I still hadn’t found a great homemade cleaner for the shower. Well, after that, I got a bunch of emails with different “recipes” for homemade shower cleaner; and although I was skeptical, I decided to try a few of them out. After experimenting these past 2 weeks (yes, our shower is now extremely clean) I’ve picked my favorite… and it’s REALLY simple! !